Adaptation projects may be difficult to prioritize and finance, as the results of projects are difficult to quantifiably measure and compare across project types, and no singular “unit” for adaptation outcomes exists. The Higher Ground Foundation is developing the Vulnerability Reduction Credit (VRC™), which incorporates cost/benefit analysis and per capita vulnerability equalization tools to measure the outputs of climate adaptation projects. The VRC quantifies in a singular unit measures to reduce vulnerability to climate change. This chapter* summarizes the structure and utility of VRCs and shows through a case study from Talle, Niger, how VRCs are created and integrated into Sahelian community adaptations to heterogeneous climate risks such as flooding and droughts. VRC analysis and crediting may serve as a monitoring and evaluation tool and as an instrument to help secure project finance while supporting sustained adaptation. The chapter further considers the potential benefits to governments, donors and economies. VRC financing has advantages over standard development assistance models, particularly for project risk management, project preparation, enhanced transparency of adaptation spend, and scaling of successful pilot projects throughout an economy. *Download the full text from the right-hand column. Summaries of the key sections are provided below. 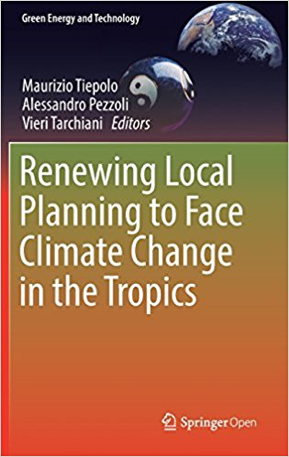 This is a chapter form the book "Renewing Local Planning to Face Climate Change in the Tropics", edited by Maurizio Tiepolo, Alessandro Pezzoli and Vieri Tarchiani. Sub-Saharan Africa is both particularly vulnerable to climate change and lacking sufficient adaptive capacity to address many of the impacts on agriculture, the built environment, health, and other sectors. The economic impact of climate change will be considerable. In the context of planning processes, research has shown few examples of climate information being integrated into the planning of long-term development. While overseas development assistance is considerable, the traditional approach (as typified by the Paris Climate Agreement) for financing climate adaptation in developing countries is to set a global monetary target, rather than focus on vulnerability reduction as the measure of results. The role of the private sector is often taken as critical in securing sufficient finance to meet the global adaptation investment requirements. However, a major challenge for getting the private sector involved is finding sufficient justification to undertake adaptation. The nature of much climate vulnerability is that, while economic returns from adaptation measures (that may be represented variously through avoided damage to buildings, etc.) are usually possible, financial returns (represented in direct project-level revenue streams) are much more difficult to achieve. And so the challenge can be seen as identifying and deploying mechanisms that can convert economic need into financial investment. When resources are allocated to adaptation, there is the risk that they may be ineffective or inefficiently invested, owing to a lack of understanding of adaptation’s benefits. In part, this risk is created because of the lack of a recognized, general approach to evaluate and compare projects undertaken to reduce vulnerabilities to climate change. For more details see section 17.1, pages 344-345 of the full text. Serve as a positive feedback mechanism as the “market” for adaptation technologies and effective project investment and operations improves through the incentive to optimize project vulnerability reduction. Create incentives for sustainable projects, as credits are issued only if projects can prove that vulnerability reduction has been ensured for a (past) period of time. The challenges to creating such an instrument that may result in these benefits, include ensuring that it transparently, efficiently, and flexibly provides quantifiable and verifiable incentives, resulting in real and additional climate vulnerability reduction for poor communities. The proposed instrument, designed to meet the above requirements, is the climate Vulnerability Reduction Credit (VRC™). A VRC represents avoided impact cost, normalized with an income equalization factor. As discussed previously, this formulation is analogous to the IPCC’ s definition of climate change vulnerability as a function of Exposure (of a system to climate change), Sensitivity (of the exposed system to climate change) and the Adaptive Capacity of the system. In generating VRCs, a project employs a cascading chain of results projection. For more details on challenges see section 17.2, page 345-346 of the full text. For more details on the VRC instrument see section 17.3, pages 346-348 of the full text. For more details on generating see section 17.4, pages 348-350 of the full text. VRCs may be used to address a number of challenges that Sahelian communities may face as they attempt to adapt to climate changes. These can be broadly divided into aiding the processes of adaptation planning and methodology development, project finance, and monitoring and evaluation. For more details see section 17.5, pages 350-351 of the full text. A way for the community to secure project finance that is aligned with its interests in sustained vulnerability reduction. The vulnerable community (along with possible development partners) are able to understand and then articulate their needs through developing a VRC baseline and being able to assess the expected results (in terms of VRCs, and by extension of vulnerability reduction) of different project alternatives. As such, the community can use this clear and quantifiable understanding of its vulnerabilities as both a decision-making tool and to articulate their needs and justify donor funding. Donors will then be able to engage with the community and its adaptation partners, with the community able to describe and justify its proposed interventions. What is perhaps the most innovative result that VRCs can offer, once a community and its partners have registered their project, is that they can then “sell” the potential vulnerability reduction to a government or donor. The vulnerability, and its reduction, transitions into being an asset for the community in its engagement with funders, and, most critically, it can offer funders a clear and relatively de-risked means of offering contingency-based finance. There are a variety of possible financing structures that VRC generating projects could lend themselves to, with perhaps the simplest being a conventional project finance model. Finally, the process of undertaking a VRC generating project can result in greater adaptive capacity as the community has tools and more immediate incentives to improve its “climate resilience”. Climate Vulnerability Reduction Credits (VRCs™) offer communities, donors, and governments in the Sahel and around the world with a process that can help overcome a number challenges related to effective climate adaptation. As the case study shows, VRCs offer to provide a needed source of funds and expertise to local communities, while helping donors and governments deliver scalable, transparent and capacity growing vulnerability reduction where it is needed most. There is considerable work required, however, to encourage adoption of the VRC. Read the book edited by Tiepolo, M. et. al. "Renewing Local Planning to Face Climate Change in the Tropics"
Schultz, K. and Adler, L. (2017) Addressing Climate Change Impacts in the Sahel Using Vulnerability Reduction Credits. In: M. Tiepolo et al. (eds. ), Renewing Local Planning to Face Climate Change in the Tropics, Green Energy and Technology, Springer International Publishing AG. Ben here, I edit the Community-Based Adaptation theme, and I'm currently temporary Editor of this Climate Finance theme. I just wanted to respond to the article briefly - I'd be happy to discuss any of the points below further! While the idea of incentivising investment into climate adaptation is a good one, there are several issues with the proposed approach for a Vulnerability Reduction Credit. measure the ‘reduction in vulnerability’ that a project creates through its activities, and thus assign a monetary value to the avoided costs of the project. All three of these assumptions are to a greater or lesser extent problematic, and ignore understanding of vulnerability as a dynamic, and multi-stressor phenomenon, the importance of actors and institutional networks, and current approaches such as adaptation pathways. On a fundamental level, it is not possible to predict localised climate impacts with any confidence - the predict-and-adapt paradigm is outdated, and should not be used as the basis to assess the costs and benefits of any adaptation project, and to measure their impact. I recognise the genuine attempt that Higher Ground are making to attempt to measure adaptation outcomes, however, as formulated I don't think that the proposed approach for a VRC is appropriate, or scientifically defensible. Thanks Ben, for starting this discussion. We definitely want to have engagement with knowledgeable adaptation experts in order to further test and if warranted improve our approach, since we feel strongly that an appropriate incentive regime such as VRCs is critical to meet many of the profound challenges in climate adaptation. A quick reaction though (and I'd like to elaborate later): I believe the design of the VRC does not necessarily conflict with a "pathways approach" to adaptation planning and activity. While there are certainly and necessarily simplifying premises in the VRC approach, and we certainly understand that climate adaptation is complex or even wicked, we have structured the VRC with a requirement to revisit project baselines, and clearly define and consider the project boundaries (physical and social), while allowing for some certainty for the VRC flows based on near- and mid-term sustained actions. I hope you join us on Monday, and look forward to a lively dialogue. Thanks again for your interest in our work! Unfortuantely I'm not available for the webinar, but will definitely look to engage in the consultation - it's refreshing that you're opening up the approah to review in that way. That would be great, Ben. We welcome your contributions. Back to your concerns: I'll further our position that the VRC aims to be deployed in pathways approaches and acknowledges the dynamic nature of vulnerable systems and adaptation responses. (1) We should consider what the VRC is: it is a metric, not a planning process. Clearly, there is a process for establishing VRCs (baseline setting from impact costs assessments, project potential to change the baseline through avoided impacts, monitoring and periodic renewal of the baseline, etc.) that has implications on the planning process, but, just as I hope you would agree that climate change impacts assessments are a useful tool for planning under multiple regimes, including pathways approaches, so is the VRC. (2) The other broad concern is that "prediction" of climate changes, impact costing, and project changes to impact costing are problemmatic. As I just mentioned, I hope you would agree that climate impact cost assessments may be useful for a variety of planning and policymaking purposes, even though we all would agree that there are multiple challenges to performing these with high confidence, at least for a variety of sectors and project types. As we hope you will see when you get involved in the public consultation of the VRC Standard Framework, we have grappled with these and it has resulted in standards that might mean a number of projects would not qualify to be registered for VRCs. To the extent that is the case, it limits VRC applicability, and we are comfortable with this, but opens up the possibility for a growing number of sectors and projects to become qualified as the science and data availability improves. During our Pilot Implementation and Partnership Phase we are working with a variety of projects and stakeholders to "learn by doing" so that the VRC Standard Framework that emerges at the end of this phase is a useful tool. However, we don't want perfection to be the enemy of the good, and just as all adaptation projects and policies are subject to a variety of scenarios and uncertainties, we want to have VRCs serve as a tool that reasonable people sitting around a table could agree is a reasonable (and ultimately dynamic) instrument for planning, target setting, and rewarding "good enough" adaptations. I hope these comments are useful and am certainly open to further exchanges to further clarify and improve.